The consumption of alcohol during pregnancy is likely to cause what is considered the most frequent preventable birth defect. This defect is fetal alcohol syndrome (FAS), which is a complex problem closely related to alcoholism and substance abuse among women. Described for the first time some 35 years ago, this syndrome has since been the subject of many studies conducted for the purpose of providing insight into its specific nature, documenting its prevalence or identifying ways to prevent it and help those who are afflicted with it. This research was conducted primarily in North America, but also in some European countries. Canada’s contribution to developing knowledge in this area should be pointed out. In December of 2003, the Institut national de santé publique du Québec was mandated by the Minister of Health and Social Services to produce a status report on FAS. In response to this request, this report describes the current state of knowledge in Québec, and its situation and achievements in this area. This report is subdivided into three main parts: Part one focuses on problem elements. 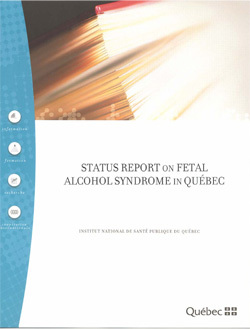 Its main aim is to document the importance of FAS, in terms of seriousness and frequency, and to provide an overview of the alcohol consumption of Québec women of childbearing age: frequency, alcohol consumption patterns and perceptions, profile of women who have problems related to alcohol and drug abuse. In part two, the focus is on intervention. The chapter begins with a description of Health Canada’s Initiative on FAS, which is a reference model used by several countries. Projects that were put in place during this Initiative are also described. This is followed by a presentation of the prevention strategies aimed at the general public and alcoholic and substance-abusing mothers, along with a description of the services available for affected children and their families. This second part ends with a general look at the practices of professionals to highlight places where their actions are required and requested. Finally, part three is reserved for discussing and analyzing the information gathered, and presenting recommendations.